Making a "simple stir-fry" isn't always all that simple if you can't get the stir-fry sauce to taste just right. But with this no-fail recipe for Thai stir-fried vegetables, the technique is a shoe-in mostly because the sauce is made up before beginning to fry the vegetables, allowing you to adjust the flavors to your liking. This can be made vegetarian/vegan by substituting soy sauce for the fish sauce. This is quite a "saucy" stir-fry that is never dry and is terrific served over rice or noodles. Feel free to experiment with your own choice of vegetables, using whatever is fresh and available where you live. Great as a side dish, you can turn it into a main course by adding tofu, wheat gluten, cashews, cooked shrimp, or slices of chicken as a protein source. Best of all it takes about 20 minutes from start to finish—perfect for gathering the family around the table for a weeknight meal. Things will go even faster if much of the slicing, dicing, and chopping is done the night before. 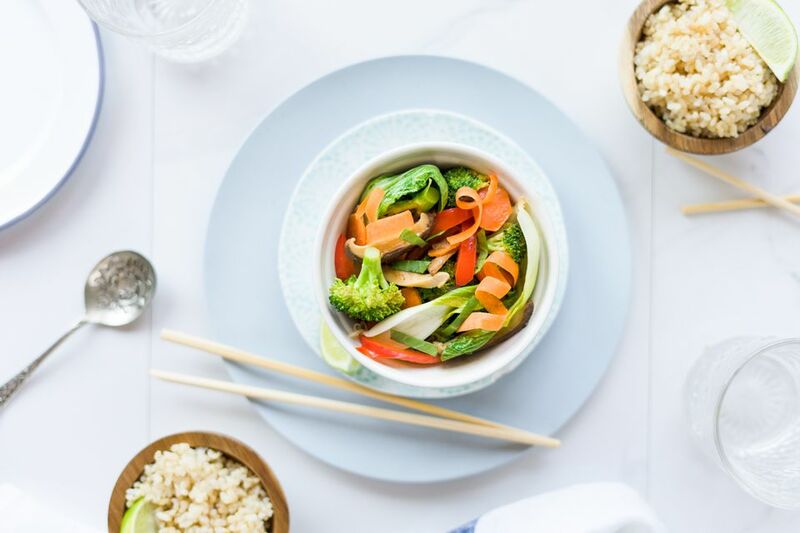 Note: while there are multiple steps to this recipe, this stir-fry is broken down into workable categories to help you better plan for cooking. In a large cup or small bowl, combine coconut milk, fish sauce, lime juice, chili flakes, and brown sugar, stirring well to dissolve the sugar. Taste-test, keeping in mind that the first taste should be spicy-salty, followed by sweetness and the rich taste of the coconut milk. Adjust these flavors to suit your taste, adding more lime juice if too sweet or salty (note that it will be less salty when combined with the vegetables). Warm a wok or large frying pan over medium-high heat. Add 2 tablespoons oil and swirl around, then add the shallots, garlic, galangal, and chili. Stir-fry 1 to 2 minutes, then add the carrot, mushrooms, optional cauliflower, and 1/4 of the stir-fry sauce. Continue stir-frying 2 to 3 minutes. Add the broccoli and red pepper plus enough stir-fry sauce to gently simmer vegetables (about 2 minutes). This is meant to be a "saucy" stir-fry that is never dry so the sauce can flavor the rice or noodles it is served with. Finally, add the bok choy or Chinese cabbage. Add more of the stir-fry sauce as needed, almost enough to just cover vegetables in sauce. Simmer until bok choy or cabbage is cooked but still bright green with some crispness (2 to 3 minutes more). Remove from heat and taste-test. If not salty enough, add a little more fish or soy sauce. If too salty or sweet, add a squeeze of lime juice. Add more sugar or chili if desired. Top with fresh basil and serve over Thai jasmine rice or Thai coconut rice. Any leftover stir-fry sauce can be stored for 1 week in a covered container in your refrigerator for future stir-fries. Use this sauce to make a main course dish by adding cooked chicken or shrimp or adding tofu/cashews if vegetarian/vegan. If using raw chicken or raw shrimp, combine with 3 tablespoons of the stir-fry sauce as a marinade. Add marinated chicken/shrimp at the beginning of stir-frying together with the shallots, garlic, galangal, and chili.